Maryhill Museum of Art’s permanent collection has been built through generous donations by those who would like to share their treasures with others. Your gift will ensure that current and future visitors to the museum experience the power of art. The object or collection does not duplicate existing objects or seem better suited to another institution. If you have an artwork you would like to offer as a possible donation to the museum, please contact our Curatorial Department by email or by post for more information about the process. Please note: Because we have a small staff, we regret that we cannot accommodate drop-in visits; if you contact us via email or US mail, we will be back in touch with you. 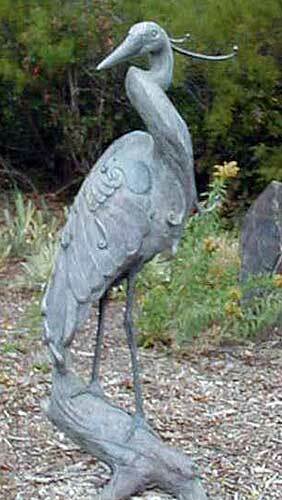 Jeffery Weitzel (Eugene, OR), The Grace Blue, 2001, bronze, 60″ x 24″ x 20″. Gift of the Arthur G. Dunn Guild, 2002.14.001. Support storage. Maryhill stores nearly 85% of the works from its collection at any given time. Proper care is essential. Support conservation. Works of art require expert care and repair. Protect exhibitions of the collection. Exhibitions require security, lighting, displays, temperature and humidity control. Funds supplied by donors help shape and improve Maryhill’s collection. In the last few years the museum has purchased, through the generosity of donors, several important works of art. For more information on gifts to support the purchase of art, please call 509 773-3733 or contact the Development Office.